With growing enforcement of environmental and health and safety regulations, remaining in compliance is becoming more costly. 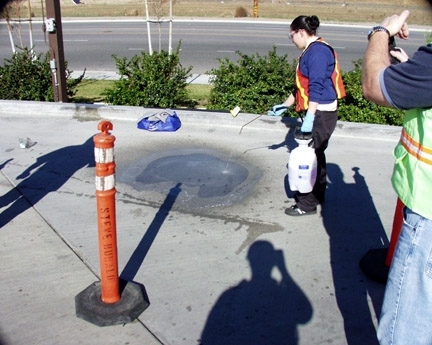 Over 20 years ago, the ECS FM 186-2 Fuel Spill Cleanup program was designed to protect your employees from cancer-causing benzene vapors and to clean up spills in an environmentally correct manner. This program can provide significant savings over a traditional hazardous waste drum program. More importantly, it ensures that you are complying with both environmental and health and safety laws. The ECS FM 186-2 program utilizes a chemistry that suppresses the dangerous vapors, protecting employees while solubilizing and encapsulating the hydrocarbon. When properly used, the wipers can be categorized as a non-hazardous waste. A side benefit is a much cleaner forecourt. According to the California Air Resources Board, there are 3,000 parts per million of benzene in gasoline vapor. OSHA has set the short-term 15-minute exposure limit at 5 parts per million, resulting in a potential exposure of 600 times the limit. FM 186-2 is a very strong vapor suppressant, and it protects the employee from exposure to this toxic chemical. As a best-management practice, the FM program helps protect the company by keeping the users in compliance with OSHA regulations. There is a high potential for fire at fueling facilities. The FM 186-2 chemistry is a strong vapor suppressant that significantly reduces the potential for fire when mixed with gasoline. When the fuel and the chemistry are mixed together, the fuel is solubilized into the water phase and encapsulated, resulting in little or no vapor to ignite. Major concerns for environmental regulators are stormwater and hazardous waste. 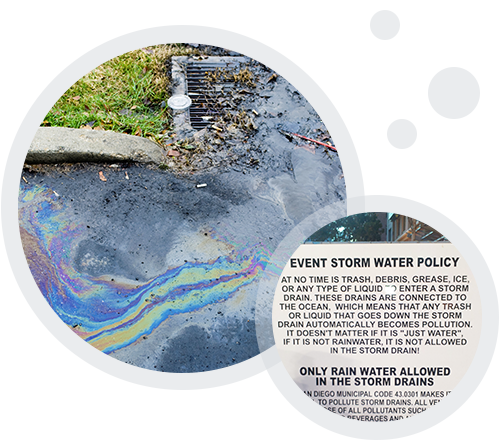 Since the Supreme Court’s decision regarding the municipalities’ and counties’ responsibility for all pollution in stormwater, regulators are looking at all sources that can reduce the impact on the stormwater system. Even though fueling locations are still considered non-point source locations, the operation is responsible for any pollution contribution. Additionally, hazardous waste disposal has come under significant scrutiny. The operation is responsible for the proper designation and disposal of spill-cleanup materials. The FM 186-2 Spill Response program addresses both of these environmental issues. By utilizing the program and properly training your staff, you can demonstrate that your operation is using a best-management program when cleaning up fuel spills. The FM 186-2 chemistry solubilizes the fuel and allows it to be removed from the concrete surface. This demonstrates that you are protecting the storm drains from potential stormwater pollution from small, medium, and large spills. The FM program has been used and reviewed for over twenty years. Because of the difficulty in siting hazardous waste landfills during the 1990’s, the government was looking for ways to reduce hazardous waste. They were looking at recycling, re-utilization, and treatment to reduce the amount of waste being classified as hazardous. During an immediate response to a spill, the FM 186-2 program met this goal by treating the spilled fuel — when properly used, it meets regulations that allow it to be disposed of as a non-hazardous waste. ECS operates in all 50 states at over 4,000 locations.